Blue Ceramic Mug: What the heck has Lynne been up to??? What the heck has Lynne been up to??? UPDATE: Sharon, the creator of Three Irish Girls yarn (one of my favorites) is having to move her studios due to safety concerns and a rising crime rate in her current location. She has a FundRazr page set up for donations here. Please help her out if you can! 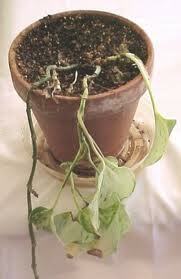 I'm kidding... mine's a philodendron, so it still looks great... the ground wasn't even dry! The last twelve days were spent in a frenzy of preparing for my trip to Chicago for Thanksgiving (the US version, since mine was more than a month ago) to visit Rob :) Also in trying to get an assignment done - the bulk of which - again - was done the afternoon the assignment was due *sigh* I don't know why I procrastinate like that. It doesn't make me happy, and I keep telling myself I need to work on it before it's due, but I can't quite bring myself to do it. Sadly, chocolate therapy doesn't work for that sort of problem. I finally finished Rob's kitchen curtain before heading out, but sadly didn't block it. I had blocking mats at his house and even brought my t-pins, but I didn't block it while I was there either. Why not? Well... it's become a tradition, because Rob so enjoys my cooking, that when I visit for more than a day or two, I fill the freezer. This means doing a ridiculous amount of groceries (he just about has a heart attack each time) and leaving the kitchen an absolute disaster, which I did. This weekend's efforts included two dozen banana muffins, one and a half dozen cranberry muffins, a batch of "Aunt Evelyn's Rock Cookies" which are apparently such a family tradition that Rob's cousin Suzanne in Florida was like "Yay! Rocks!". Then we moved on to the savory dishes and came away with a batch of chili, a batch of spaghetti sauce, a batch of seafood rosé sauce and a lasagna. Rob's freezer is full of plastic containers of all these yummy things, which will hopefully tide him over until the next time I come over. 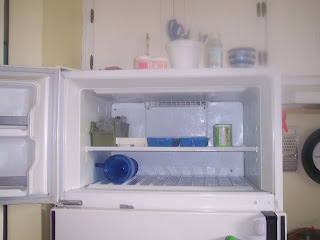 No exaggeration, this is what his freezer looked like when I arrived... no this one isn' t actually his. I had managed to finish one orange sock (plain vanilla pattern) and was nearly done one Falling Leaves sock before I headed out, so I had two brand new socks to work on. I cast on the second orange sock at the airport while waiting for my first flight on Wednesday, and it's now at the heel gusset pickups. I finished the first Falling Leaves sock while watching Quantum of Solace (the first two Daniel Craig bond films hadn't really stuck well with me, so I had to rewatch before going to see the new one) and cast on the second one and finished the cuff before coming home. I hadn't brought the pattern with me - too fiddly on an airplane - so that's all I was able to do. I need to finish some older projects... either Tempting or the crochet blanket. We've been doing a 12 in 2012 KAL on the Ottawa Area Ravellers' board (Ravelry) where we're supposed to knit 12 projects entirely from yarns that have been in our stash for more than 6 months before the year is out, and I'm only up to #9. Good things: I have two nearly-completed pairs of socks for ME! There are only two Tuesday classes left before the final exam (YAY - I am so ready for this class to be OVER!). I am starting a new non-university class on Monday evenings which I'm very nervous and excited about! So all that insanity is pretty much what I've been up to in the last couple of weeks. (Actually, that mostly just covers the last few days, but the rest of it has been boring). Cheers! Sounds like you had a really busy weekend. It was quiet around here, which is just the way I like it. I love your account of filling the freezer. My roommate does that for her sons when she goes to visit them. Let the insanity - I mean weekend - begin!